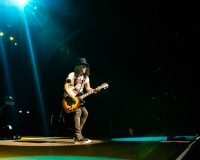 A truly legendary guitarist, Slash will go down in history as one of the greats. 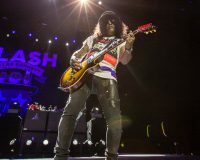 Rising to notoriety with LA rock gods Guns N’ Roses, he has transcended that band and become something of folklore; a rock icon in his own right, whose look and stance is emulated in video games, and whose sound influenced a generation of hard rock guitarists. 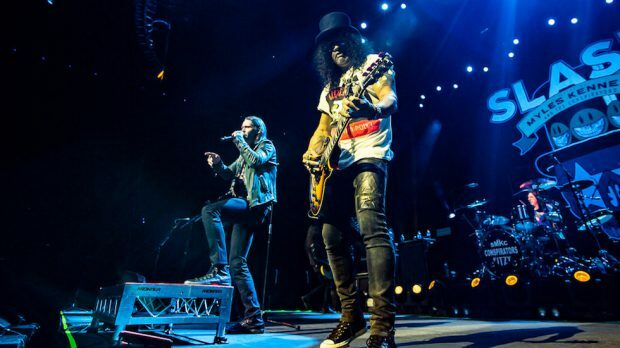 Touring with Myles Kennedy & The Conspirators gives Slash a chance to relax, step out of the shadow of his other band and into the spotlight, get back to basics and just kick out the jams. 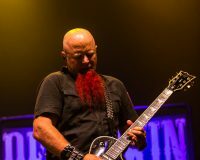 And any chance to witness the man doing his thing in person is worth it. 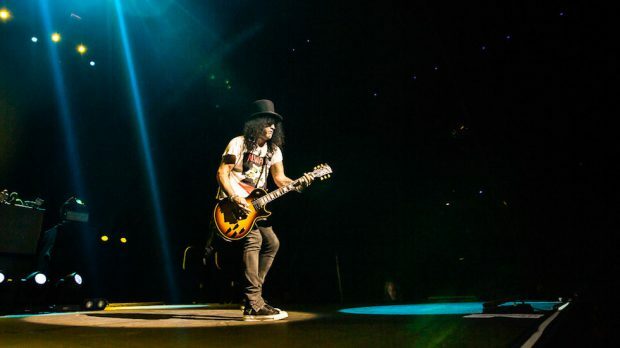 Booking the Arena on a Sunday night may have been a little overly ambitious, perhaps a smaller venue like Metro City (like his previous tour) would have been more appropriate and been packed with more atmosphere. 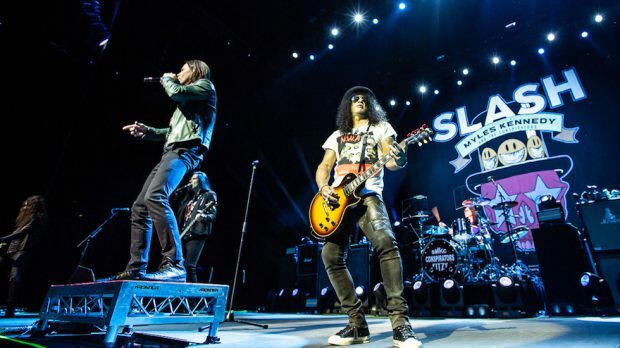 Following the monumental reformation of Gunners with Axl, Duff and Slash, and their massive 2017 stadium tour here – a lot of old school fans got their wish fulfilled, and perhaps weren’t quite as excited about seeing Slash again so soon. 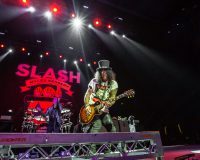 But the die hard fans who love what the man does, and know his extensive catalogue with The Conspirators, were as pumped as ever to see the legend back in town. 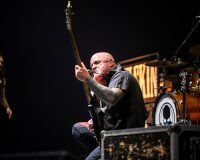 The upper tiers of the Arena weren’t open and the bottom tiers weren’t full, thinning out a little during the night – but the GA standing section was comfortably packed, and the best place to be, with keen fans pushed right up to the barrier, angling for the best view. 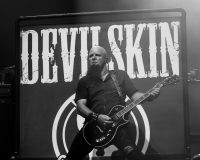 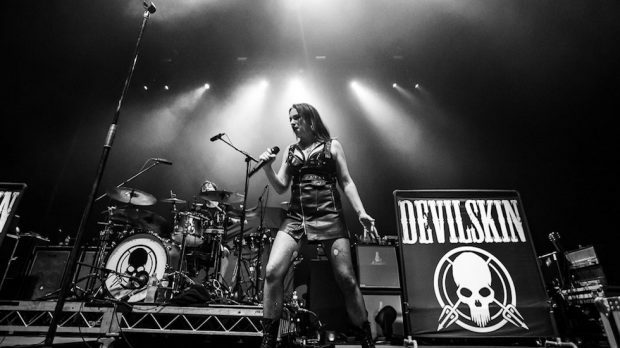 Scoring the support slot were Devilskin, a four-piece alternative metal band from Hamilton, New Zealand, on their first visit to Perth. 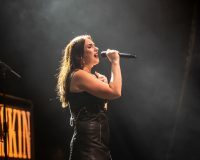 Clad in black, the band warmed up the crowd with classic heavy metal tracks like the amusingly named Elvis Presley Circle Pit, and finished with Violation from the 2014 debut album, which features powerhouse vocalist Jennie Skulander alternating between more melodic vocals and a fierce, guttural metal growl. 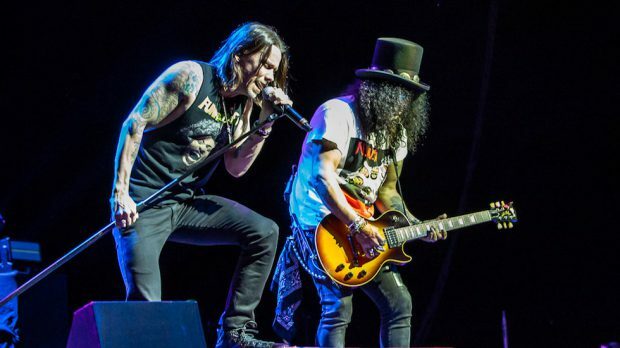 Kicking off with The Call Of The Wild, the opening track from their new album from last year Living The Dream, Slash Ft. Myles Kennedy & The Conspirators got right into it, the band flexing their musical muscle and Myles Kennedy stretching out his vocals. 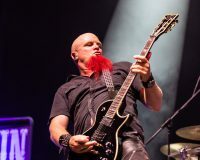 Following it up quickly was the epic sounds of Halo, with that distinct guitar tone Slash has made his own. 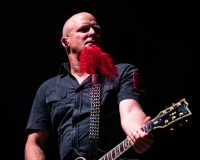 With only a wah-wah pedal in front of him, he doesn’t need all the effects, he knows his tone, that classic sound, just swapping guitars every now and then. 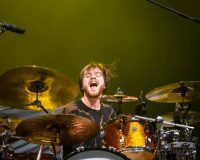 The moderate crowd needed a bit of prodding, and Myles was happy to play the hype man, getting the pit fired up. 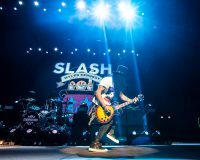 It might not have been the biggest or most lively crowd, but they were an excitable bunch, with many clearly familiar with the songs – cheers going up during the opening riffs of Back From Cali – a classic track from Slash’s 2010 self-titled debut. 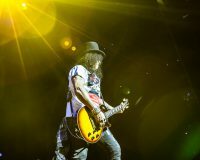 Bent To Fly was a big tune with a more melodic vibe, and a guitar tone not unlike Don’t Cry, which emphasised the similarity of Kennedy’s vocals to Axl’s. 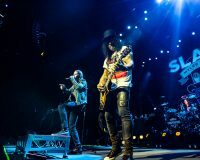 The entertaining bass player Todd Kerns stepped up to the mic to sing the Iggy Pop featuring We’re All Gonna Die with its catchy chorus “We’re all gonna die, so let’s get high,” and then continued on vocals for a song they dedicated to Lemmy, Dr. Alibi. 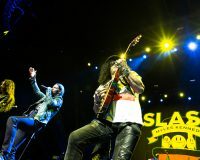 While the band were performing hard, it was a simple stage set with minimal bells and whistles, just some lights and a big Slash banner behind the stage. 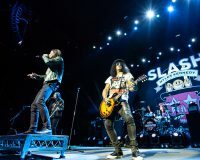 This caused it to lack some impact and atmosphere, but was really just stripping things back to basics – the complete antithesis of a Guns N’ Roses show. 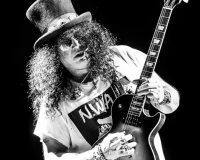 And while the band are all impressive musicians, and Kennedy a good frontman, they know whose band it – at times during solos, the band step back, happy to lay down the rhythmic foundation for Slash to step into the spotlight and tear it up, with his mop of hair under that iconic top hat. 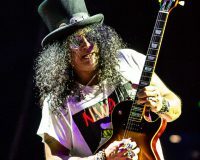 Displaying his wide ranging influences, Slash gave a nod to some fellow LA legends, sporting an NWA t-shirt. 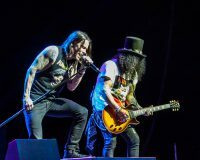 People were starting to wonder if they were going to get any Gunners songs (as The Conspirators have played in the past), and finally towards the end of the set, the familiar opening riff of Nightrain drew some howls. 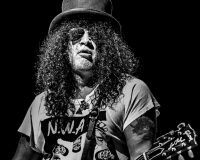 It was a rollicking run through, though those that thought it might have been the start of a string of GN’R classics were sadly disappointed as it was the only inclusion. 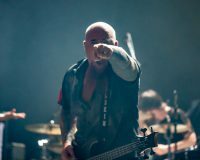 The band seemed keen to establish their own identity, and with several albums now they have a deep catalogue. 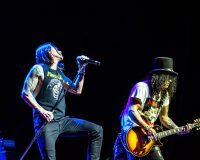 Starlight was another anthem, with Kennedy again sounding more like Axl than Axl does. 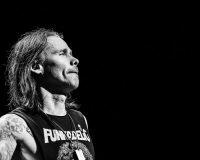 Though he might lack some of the character, he has that power and pitch that Axl once possessed. 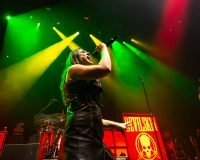 They brought the night to a close with a big rendition of Anastasia from 2012’s Apocalyptic Love, before taking and bow and walking off. 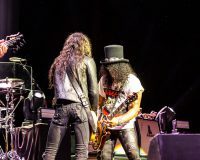 For pure Slash fans, it was an indulgent treat.